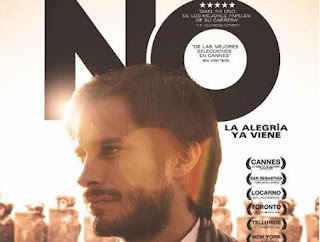 When you click on the website of CinemaChile, the promoter of Chilean films around the world, you see a close-up of Mexican actor Gael García Bernal looking over his shoulder, a huge rainbow blurred out in the background. No one familiar with Chilean film needs the tiny caption. It’s from the movie “No,” released in 2012, now representing Chile at the Academy Awards as the country’s first-ever Oscar nomination. With the Oscar ceremony set for Sunday evening,Santiago’s small but thriving film world is preparing for a late night — the broadcast will start at 9 p.m. local time. And the habitual local pessimism is yielding to a spot of hope. “We celebrated in the office, we celebrated with the film’s team,” says CinemaChile Executive Director Constanza Arena. Just having a film nominated, she says, felt “like winning the soccer world championship." The movie portrays the battle of advertising campaigns that drew to a close with Chileans voting to end the dictatorship of Gen. Augusto Pinochet. The beautiful and talented García Bernal plays René Saavedra, the advertising executive whose optimistic messaging overcame decades of left-wing bitterness (Mr. Pinochet ran Chile from 1973 to 1990, killing thousands of political opponents and creating torture centers across the country) and fueled the victory of the “No” option. “No,” as in no more dictatorship, and “No,” as in the name of the movie. So don’t look to “No” for a definitive history of the transition from dictatorship to democracy. Instead, look for a drama that shows how a few people overcame fears and took part in the creation of a freer country. And Chile is freer. This fundamentally anti-Pinochet film was shown for weeks in an attractive screening room under the presidential palace, even as former Pinochet advisers worked in their government offices upstairs. Chile has had a film industry for more than a century, but as in most small countries, even a local blockbuster may never see popularity outside the country. Legendary local names Miguel Littin(who was nominated for Oscars for films produced outside Chile) and Patricio Guzmán don’t even have head shots posted on IMDB.com, the go-to source for film information. With minimal state support, a domestic market with half the population of California, and a challenging dialect of Spanish, Chilean film has been isolated. Isolation, while posing problems for filmmakers seeking distribution, may also add to the distinctive character of “No.” The final scene shows Mr. Saavedra, after the victorious election campaign, moving on to his next advertising gig, promoting a superficial TV melodrama. It’s an accurate portrayal of how the political, commercial, and cultural model associated with Pinochet outlived the dictatorship itself. The ending adds a distinctively Chilean dose of irony to what might otherwise have been a Hollywood fairy tale.